The men of the Chambri tribe—found in East Sepik province—are commonly referred to as The Crocodile Men of Papua New Guinea. The tribe, like many indigenous races, practices a ritual initiation for boys entering manhood. 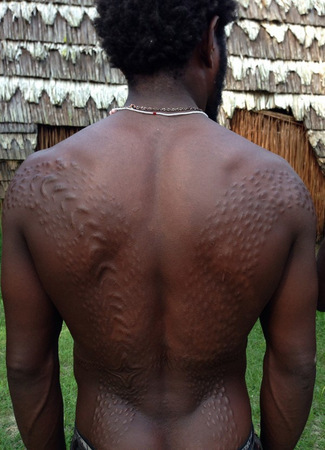 The ceremony includes crocodile scarification, a ritual where the skin is covered in deep cuts which cascade down the boy’s back, chest and buttocks, imparting the look and feeling of a crocodile’s skin. 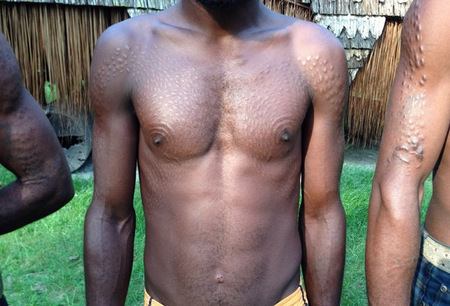 The marks are representative of the tooth marks left behind by the crocodile as it “swallowed” the young man during the ceremony. Crocodiles are sacred to the local people. Ancient lore states that humans evolved from crocodiles, becoming land-dwellers when they migrated from the nearby Sepik River. Boys of the tribe—aged 11 to 30 years of age—pay tribute to their crocodile ancestors by living in a spirit house for the six weeks leading up to the initiation ceremony. Tribal elders use bamboo slivers to make hundreds of deep slices, slightly less than an inch in length. During this time the boy is held down and not allowed any pain relief other than the chewing of medicinal plant leaves. It’s believed that withstanding such great pain at a young age means that he will be capable of overcoming pain later in life. Once the cutting is complete, the boy lies close to the fire, where smoke is blown into the wounds and clay and tree oil are pushed into the cuts in order to ensure the scars remain raised once they are healed. At the end of the initiation the boys don ornate jewelry and headdresses and participate in a tribal ceremony, becoming not men, but crocodiles. This is just one tribe you’ll meet if you join Beth on our annual Papua New Guinea tour.